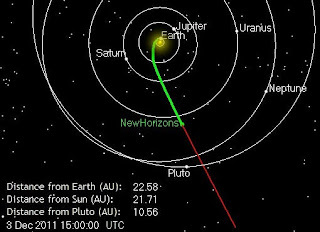 NASA’s New Horizons mission reached a special milestone yesterday, Dec. 2, 2011, on its way to reconnoiter the Pluto system, coming closer to Pluto than any other spacecraft. It’s taken New Horizons 2,143 days of high-speed flight – covering more than a million kilometers per day for nearly six years—to break the closest-approach mark of 1.58 billion kilometers set by NASA’s Voyager 1 in January 1986. Click on the image to view the current position of New Horizons as it races toward Pluto. From New Horizons’ current distance to Pluto – about as far as Earth is from Saturn – Pluto remains just a faint point of light. But by the time New Horizons sails through the Pluto system in mid-2015, the planet and its moons will be so close that the spacecraft’s cameras will spot features as small as a football field. New Horizons is currently in hibernation, with all but its most essential systems turned off, speeding away from the Sun at more than 55,500 kilometers per hour. Operators at the Applied Physics Lab will “wake” the spacecraft in January for a month of testing and maintenance activities.